Scott Sommerdorf | The Salt Lake Tribune Karen Huntsman, center, follows the casket of her husband, Jon M. Huntsman, while walking alongside her son Mark while followed by Christena Huntsman Durham, at left after the funeral services for Jon M. Huntsman, Sr., Saturday, February, 10, 2018. Scott Sommerdorf | The Salt Lake Tribune The Huntsman family reacts as they listen to a funny story being told by Jon Huntsman Jr. at the funeral services for Jon M. Huntsman, Sr., Saturday, February, 10, 2018. (Steve Griffin | The Salt Lake Tribune) The Huntsman Center begins to fill up prior to funeral services for Jon Huntsman Sr. at the arena on the University of Utah campus in Salt Lake City Saturday February 10, 2018. (Steve Griffin | The Salt Lake Tribune) The Huntsman Center begins to fill up prior to funeral services for Jon Huntsman Sr. at the arena on the University of Utah campus in Salt Lake City Saturday February 10, 2018. Scott Sommerdorf | The Salt Lake Tribune The hearse carrying the casket of Jon Huntsman Sr., leaves the Huntsman Center at the University of Utah after the funeral services for Jon M. Huntsman, Sr., Saturday, February, 10, 2018. Scott Sommerdorf | The Salt Lake Tribune Gail Miller, left, and Mary Beckerle, CEO and Director of Huntsman Cancer Institute, right, stand at the end of the funeral services for Jon M. Huntsman, Sr., Saturday, February, 10, 2018. 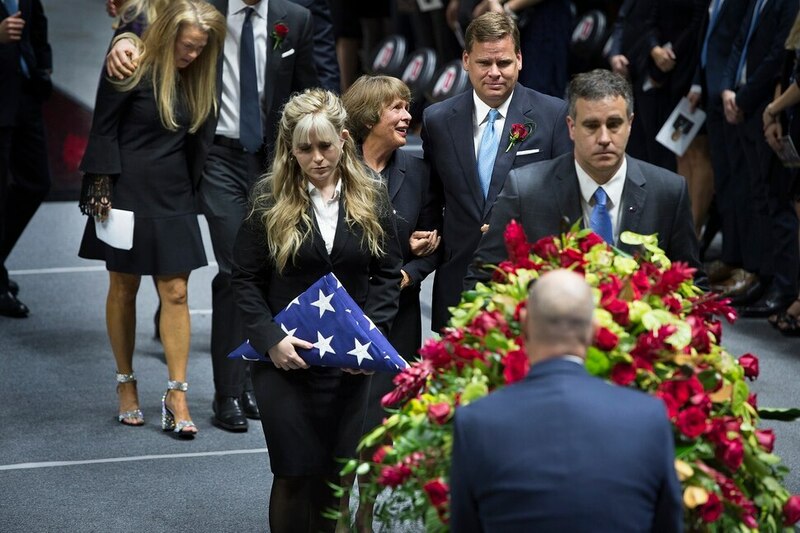 Scott Sommerdorf | The Salt Lake Tribune The Huntsman family follows the casket at the conclusion of the funeral services for Jon M. Huntsman, Sr., Saturday, February, 10, 2018. Scott Sommerdorf | The Salt Lake Tribune Ambassador, and former Utah Governor Jon Huntsman Jr. speaks about his father during the funeral services for Jon M. Huntsman, Sr., Saturday, February, 10, 2018. Scott Sommerdorf | The Salt Lake Tribune Mary Kay Huntsman leaves the services with her son at the conclusion of funeral services for Jon M. Huntsman, Sr., Saturday, February, 10, 2018. Scott Sommerdorf | The Salt Lake Tribune The casket holding Jon Huntsman Sr., is brought into the arena at the funeral services for Jon M. Huntsman, Sr., Saturday, February, 10, 2018. Scott Sommerdorf | The Salt Lake Tribune Karen Huntsman steps away from the casket carrying her husband, Jon M. Huntsman Sr., at the conclusion of funeral services for her husband, at the Huntsman Center at the University of Utah, Saturday, February, 10, 2018. (Trent Nelson | The Salt Lake Tribune) Grandchildren release balloons at the graveside service for Jon Huntsman Sr. at Wasatch Lawn Memorial Park & Mortuary in Salt Lake City, Saturday February 10, 2018. (Trent Nelson | The Salt Lake Tribune) An honor guard at the graveside service for Jon Huntsman Sr. at Wasatch Lawn Memorial Park & Mortuary in Salt Lake City, Saturday February 10, 2018. (Trent Nelson | The Salt Lake Tribune) Pallbearers at the graveside service for Jon Huntsman Sr. at Wasatch Lawn Memorial Park & Mortuary in Salt Lake City, Saturday February 10, 2018. (Trent Nelson | The Salt Lake Tribune) Jon Huntsman Jr. and Karen Huntsman at the graveside service for Jon Huntsman Sr. at Wasatch Lawn Memorial Park & Mortuary in Salt Lake City, Saturday February 10, 2018. (Trent Nelson | The Salt Lake Tribune) Jon Huntsman Jr. and Karen Huntsman at the graveside service for Jon Huntsman Sr. at Wasatch Lawn Memorial Park & Mortuary in Salt Lake City, Saturday February 10, 2018. (Trent Nelson | The Salt Lake Tribune) Jon Huntsman Jr. and Karen Huntsman at the graveside service for Jon Huntsman Sr. at Wasatch Lawn Memorial Park & Mortuary in Salt Lake City, Saturday February 10, 2018. (Trent Nelson | The Salt Lake Tribune) Jon Huntsman Jr. at the graveside service for Jon Huntsman Sr. at Wasatch Lawn Memorial Park & Mortuary in Salt Lake City, Saturday February 10, 2018. (Trent Nelson | The Salt Lake Tribune) The Salt Lake City Police Department Motorcycle Squad at the graveside service for Jon Huntsman Sr. at Wasatch Lawn Memorial Park & Mortuary in Salt Lake City, Saturday February 10, 2018. (Trent Nelson | The Salt Lake Tribune) Jon Huntsman Jr. and Karen Huntsman at the graveside service for Jon Huntsman Sr. at Wasatch Lawn Memorial Park & Mortuary in Salt Lake City, Saturday February 10, 2018. Scott Sommerdorf | The Salt Lake Tribune With the University of Utah basketball team behind him, Utah head coach Larry Krystkowiak is comforted by his wife Jan as he reacts with some emotion during the funeral services for Jon M. Huntsman, Sr., Saturday, February, 10, 2018. At right is former University president David W. Pershing. Scott Sommerdorf | The Salt Lake Tribune Members of the Huntsman family react as they listen to family members speak during the funeral services for Jon M. Huntsman, Sr., Saturday, February, 10, 2018. Scott Sommerdorf | The Salt Lake Tribune Members of the Huntsman family react as they listen to family members speak during the funeral services for Jon M. Huntsman, Sr., Saturday, February, 10, 2018. Scott Sommerdorf | The Salt Lake Tribune Members of the Huntsman family react as they listen to Paul Huntsman speak at the funeral services for Jon M. Huntsman, Sr., Saturday, February, 10, 2018. Scott Sommerdorf | The Salt Lake Tribune Ambassador Jon Huntsman Jr., with Utah Governor Gary Herbert at the funeral services for Jon M. Huntsman, Sr., Saturday, February, 10, 2018. Scott Sommerdorf | The Salt Lake Tribune Mark Huntsman walks with his mother Karen at the funeral services for Jon M. Huntsman, Sr., Saturday, February, 10, 2018. Scott Sommerdorf | The Salt Lake Tribune Ambassador Jon Huntsman Jr. speaks with Elder Deiter Uchtdorf of the LDS Church at the funeral services for Jon M. Huntsman, Sr., Saturday, February, 10, 2018. Scott Sommerdorf | The Salt Lake Tribune Jennifer Huntsman Parkin with her brother Mark, speaks at the funeral services for Jon M. Huntsman, Sr., Saturday, February, 10, 2018. Scott Sommerdorf | The Salt Lake Tribune Peter Huntsman watches as people arrive, with his mother Karen, at the funeral services for Jon M. Huntsman, Sr., Saturday, February, 10, 2018. Scott Sommerdorf | The Salt Lake Tribune Peter Huntsman walks with his mother Karen at the funeral services for Jon M. Huntsman, Sr., Saturday, February, 10, 2018. Scott Sommerdorf | The Salt Lake Tribune Ambassador Jon Huntsman Jr, left, hugs his brother Peter Huntsman, after Peter had spoken at the funeral services for Jon M. Huntsman, Sr., Saturday, February, 10, 2018. Scott Sommerdorf | The Salt Lake Tribune Jon Huntsman Jr. walks with his mother Karen at the funeral services for Jon M. Huntsman, Sr., Saturday, February, 10, 2018. Scott Sommerdorf | The Salt Lake Tribune Peter Huntsman speaks at the funeral services for Jon M. Huntsman, Sr., Saturday, February, 10, 2018. Scott Sommerdorf | The Salt Lake Tribune Ambassador Jon Huntsman Jr. speaks about his father at the funeral services for Jon M. Huntsman, Sr., Saturday, February, 10, 2018. Scott Sommerdorf | The Salt Lake Tribune James Huntsman speaks at the funeral services for his father, Jon M. Huntsman, Sr., Saturday, February, 10, 2018. Scott Sommerdorf | The Salt Lake Tribune Peter Huntsman pauses as he tearfully tells a story about his father at the funeral services for Jon M. Huntsman, Sr., Saturday, February, 10, 2018. Scott Sommerdorf | The Salt Lake Tribune Ambassador Jon Huntsman Jr. waves as people arrive at the funeral services for Jon M. Huntsman, Sr., Saturday, February, 10, 2018. Scott Sommerdorf | The Salt Lake Tribune Christena Huntsman Durham speaks tearfully about her father at the funeral services for Jon M. Huntsman, Sr., Saturday, February, 10, 2018. Scott Sommerdorf | The Salt Lake Tribune Ambassador Jon Huntsman Jr. reaches over to speak with his sister Christena Huntsman Parkin after she spoke at the funeral services for Jon M. Huntsman, Sr., Saturday, February, 10, 2018. Scott Sommerdorf | The Salt Lake Tribune Paul Huntsman speaks at the funeral services for his father Jon M. Huntsman, Sr., Saturday, February, 10, 2018. (Steve Griffin | The Salt Lake Tribune) Peter Huntsman hugs his brother Jon Huntsman Jr. after he spoke during funeral services for Jon Huntsman Sr. at the Huntsman Center on the University of Utah campus in Salt Lake City Saturday February 10, 2018. (Steve Griffin | The Salt Lake Tribune) Paul Huntsman speaks about his father during funeral services for Jon Huntsman Sr. at the Huntsman Center on the University of Utah campus in Salt Lake City Saturday February 10, 2018. (Steve Griffin | The Salt Lake Tribune) Jon Huntsman's children and family members carry his casket following funeral services at the Huntsman Center on the University of Utah campus in Salt Lake City Saturday February 10, 2018. (Steve Griffin | The Salt Lake Tribune) Peter Huntsman becomes emotional as he tells about chairing his first board meeting following his father's death during funeral services for Jon Huntsman Sr. at the Huntsman Center on the University of Utah campus in Salt Lake City Saturday February 10, 2018. (Steve Griffin | The Salt Lake Tribune) Peter Huntsman smiles as he tells stories about some of his fathers less famous business adventures, most of which lost money, during funeral services for Jon Huntsman Sr. at the Huntsman Center on the University of Utah campus in Salt Lake City Saturday February 10, 2018. (Steve Griffin | The Salt Lake Tribune) Christena Huntsman Durham is consoled by her brothers Paul Huntsman and Jon Huntsman Jr. after after she spoke during funeral services for Jon Huntsman Sr. at the Huntsman Center on the University of Utah campus in Salt Lake City Saturday February 10, 2018. (Steve Griffin | The Salt Lake Tribune) Jon Huntsman Jr. speaks about his father's legacy during funeral services for Jon Huntsman Sr. at the Huntsman Center on the University of Utah campus in Salt Lake City Saturday February 10, 2018. (Steve Griffin | The Salt Lake Tribune) Jon Huntsman Jr. speaks about his father's legacy during funeral services for Jon Huntsman Sr. at the Huntsman Center on the University of Utah campus in Salt Lake City Saturday February 10, 2018. (Steve Griffin | The Salt Lake Tribune) The Huntsman Center begins to fill up prior to funeral services for Jon Huntsman Sr. at the arena on the University of Utah campus in Salt Lake City Saturday February 10, 2018. (Steve Griffin | The Salt Lake Tribune) President M. Russell Ballard holds scriptures belonging to Jon Huntsman Sr., his long time friend, during funeral services for Jon Huntsman Sr. at the Huntsman Center on the University of Utah campus in Salt Lake City Saturday February 10, 2018. (Steve Griffin | The Salt Lake Tribune) The casket of Jon Huntsman Sr. is brought into the Huntsman Center during funeral services on the University of Utah campus in Salt Lake City Saturday February 10, 2018. (Steve Griffin | The Salt Lake Tribune) The casket of Jon Huntsman Sr. sits near center court of the Huntsman Center during funeral services on the University of Utah campus in Salt Lake City Saturday February 10, 2018. (Steve Griffin | The Salt Lake Tribune) Jennifer Huntsman Parkin stands with her brother Mark Huntsman as she talks about her memories of her father as a young girl during funeral services for Jon Huntsman Sr. at the Huntsman Center on the University of Utah campus in Salt Lake City Saturday February 10, 2018. (Steve Griffin | The Salt Lake Tribune) Jon Huntsman Jr. speaks about his father's legacy during funeral services for Jon Huntsman Sr. at the Huntsman Center on the University of Utah campus in Salt Lake City Saturday February 10, 2018. (Steve Griffin | The Salt Lake Tribune) LDS Church President Russell M. Nelson talks to the children of Jon Huntsman Sr. during funeral services for Jon Huntsman Sr. at the Huntsman Center on the University of Utah campus in Salt Lake City Saturday February 10, 2018. (Steve Griffin | The Salt Lake Tribune) The Huntsman Center begins to fill up prior to funeral services for Jon Huntsman Sr. at the arena on the University of Utah campus in Salt Lake City Saturday February 10, 2018. (Steve Griffin | The Salt Lake Tribune) Jon Huntsman Jr. speaks about his father's legacy during funeral services for Jon Huntsman Sr. at the Huntsman Center on the University of Utah campus in Salt Lake City Saturday February 10, 2018. (Steve Griffin | The Salt Lake Tribune) The casket of Jon Huntsman Sr. is brought into the Huntsman Center during funeral services on the University of Utah campus in Salt Lake City Saturday February 10, 2018. (Steve Griffin | The Salt Lake Tribune) The casket of Jon Huntsman Sr. is brought into the Huntsman Center during funeral services on the University of Utah campus in Salt Lake City Saturday February 10, 2018. (Steve Griffin | The Salt Lake Tribune) The hearse leaves the Huntsman Center following funeral services for Jon Huntsman Sr. on the University of Utah campus in Salt Lake City Saturday February 10, 2018. (Steve Griffin | The Salt Lake Tribune) Karen Huntsman walks with her son Jon Huntsman Jr. prior to funeral services for Jon Huntsman Sr. at the Huntsman Center on the University of Utah campus in Salt Lake City Saturday February 10, 2018. (Steve Griffin | The Salt Lake Tribune) The casket of Jon Huntsman Sr. is brought into the Huntsman Center during funeral services on the University of Utah campus in Salt Lake City Saturday February 10, 2018. Jennifer Huntsman Parkin had already spotted her dad walking around their neighborhood, exercising as Elvis Presley crooned through his headphones, so she knew what the knock at her door meant. When she opened it, he stood there grinning with a spoon in his hand. “Got any chocolate ice cream?” Jon Huntsman Sr. asked. He quickly snuck inside her house, which was next to his, and urged Parkin not to tell her mother. It was their little routine. “Oh, how I will miss that knock on the door,” Parkin recounted to the 2,000 people gathered at the University of Utah to eulogize Huntsman on Saturday during his funeral, held in the basketball arena that bears his name. She and her siblings talked of a man who liked slightly stale Peeps and singing Sam Cooke in the car. They spoke of the dynasty he created, the morals he lived by, the passion he had. He was smart and hardworking and, well, hard to fully describe. James Huntsman said his dad always went big — even when pranking someone. Peter Huntsman joked that he thought the internet would just be a fad and email would go out of style in a year. Jon Huntsman Jr. said he lost not just a father but a best friend. While, for Huntsman, his children and his wife Karen certainly came first, his faith followed as a close second. LDS Church President Russell M. Nelson presided over the service and offered concluding remarks, detailing the devotion and charity of the late businessman and philanthropist, who died Feb. 2 at the age of 80. Huntsman, who often lent his private jet to Mormon prophets, served as a bishop, stake president, mission president and an area Seventy. “Brother Huntsman — an extraordinary man, an exceptional leader — achieved great success and brought honor and distinction to the people of the state of Utah,” Nelson said. Huntsman and Ballard took turns wheeling each other around the hospital after surgeries, which became a frequent occurrence for Huntsman in his later years. “I don’t know how the nurses let us do that,” Ballard said to chuckles from the crowd. Watch a livestream of the funeral services for Huntsman Cancer Institute’s founder, Jon M. Huntsman. Huntsman was diagnosed with prostate cancer in 1991, the same disease his father had succumbed to. After a traumatic, 11-day hospital stay for treatment, he decided he wanted to change the experience for future patients. He founded the Huntsman Cancer Institute and his family, through a foundation, still guides the fundraising and marketing of the growing medical campus. Peter Huntsman will guide that part of his father’s legacy as CEO of the Huntsman Cancer Foundation. He has served as CEO of Huntsman Chemical, the billion-dollar industrial giant that has made the family wealthy. And, recently, Peter took over as chairman of the board, a position his father long held. He told the crowd gathered Saturday that earlier in the week, he had chaired his first board meeting without his dad. Huntsman expected his eight surviving children would follow his lead in faith, business, philanthropy and politics (his daughter Kathleen died in 2010 at 44). And they promised to do so in their speeches, which were peppered with personal remembrances. (Tribune file photo) Jon Huntsman in 2005. (photo courtesy Huntsman family) Jon and Karen Huntsman were married in June 1959. (photo courtesy Huntsman family) Jon Huntsman and his brother Blaine in 1964. (photo courtesy Huntsman family) Jon Huntsman meets Pope John Paul II in 1993. (Al Hartmann | The Salt Lake Tribune) Karen and Jon Huntsman speak at the dedication of the Huntsman Cancer Institute Hospital expansion on October 28, 2011. (photo courtesy Huntsman family) Jon Huntsman as a high school senior. (Tribune file photo) Jon Huntsman, President Thomas S. Monson of the LDS First Presidency, Janet Bingham, president of the Huntsman Cancer Foundation on July 12, 2006. They were at an event marking the second anniversary of the opening of Huntsman Cancer Institute. (Steve Griffin | Tribune file photo) L-R, Spence Eccles, CEO of the Utah Division of Wells Fargo Bank, Esther Landa, past president of the National Council of Jewish Women, Bernard Machen, president of the University of Utah, Jon M. Huntsman, chairman of the Huntsman Corporation and Norma Matheson, former First Lady of the state of Utah, are all part of a new group called the Alliance for Unity that met on the steps of the capitol Sept. 17, 2001 for a press conference introducing the new group. The group, which has a diverse culteral and religous membership, is trying to urge our community to come together and be more accepting of each other. (Tribune file photo) Karen and Jon Huntsman in one of the units in the new battered women's shelter at the YWCA in November 1997. (photo courtesy Huntsman family) Jon Huntsman, Sr., and his oldest son, Jon, Jr., in 1968 in Fillmore, Utah. (photo courtesy Huntsman family) Jon Huntsman visits with children in Gyumri, Armenia, in October 2000. (photo courtesy Huntsman family) Jon Huntsman cradles his son, Jon Huntsman, Jr., in this photo from 1960. (Francisco Kjolseth | The Salt Lake Tribune) Professor Jody Rosenblatt is comforted by Huntsman Cancer Institute founder Jon Huntsman Sr. following the unexpected news that Mary Beckerle, acclaimed researcher at Hunstman Cancer Institute was fired from her post as CEO and director of the Institute. In an email sent Monday afternoon, Vivian Lee, senior Vice President of Health Sciences at the University of Utah announced the departure without reason. (photo courtesy Huntsman family) Jon Huntsman with his family in 1948. (Tribune file photo) Jon Huntsman exits a company plane with two of his grandchildren, Madeline and Paul Jr., in this July 1999 photo. (Chris Detrick | Tribune file photo) Jon Huntsman Jr and Sr walk around Deer Valley Resort in June 2007. (photo courtesy Huntsman family) Jon Huntsman Sr., attends an event honoring Dr. Armand Hammer at the Church Office Building in Salt Lake City, April 18, 1990. (photo courtesy Huntsman family) Jon Huntsman tours a petrochemical facility in Jurong Island, Singapore, during a trip in 2007. (photo courtesy Huntsman family) The Huntsman family visits with President Ronald Reagan in the Oval Office in 1983. (photo courtesy Huntsman family) Jon Huntsman rings the bell at the New York Stock Exchange in February 2005. (photo courtesy Huntsman family) Jon and Karen Huntsman with their adult children in 2009. (photo courtesy Huntsman family) Jon Huntsman participates in the Olympic Torch relay in 2002. (photo courtesy Huntsman family) The Huntsman family visits with President Richard Nixon in the Oval Office in 1971. (photo courtesy Huntsman family) Jon Huntsman fishes with LDS Church President Thomas S. Monson in 2009. 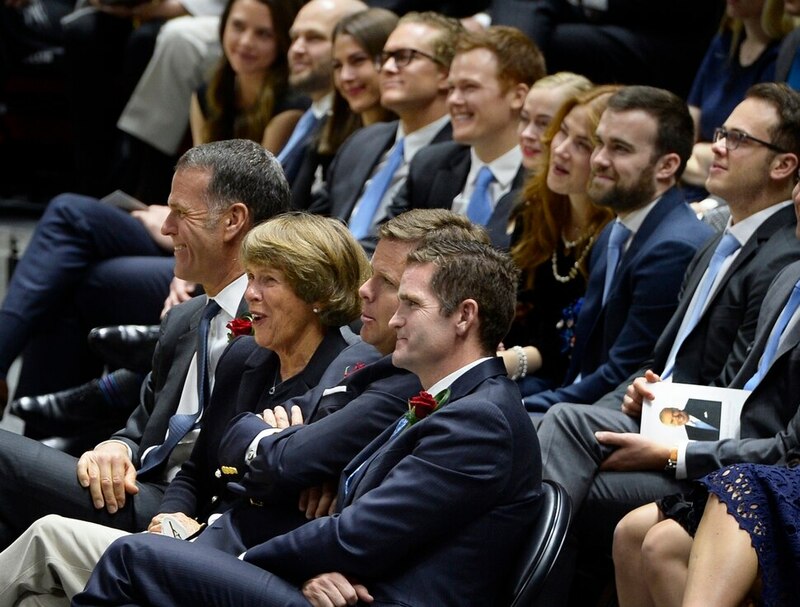 (photo courtesy Huntsman family) The extended family of Jon and Karen Huntsman in 2013. (Al Hartmann | The Salt Lake Tribune) Jon Huntsman in 2011. (Tribune file photo) Jon Huntsman. (Tribune file photo) Karen and Jon Huntsman in 1995. (Steve Griffin | Tribune file photo) Jon Huntsman listens to his wife Karen during an interview in his office in Salt Lake City in 2004. (photo courtesy Huntsman family) Jon Huntsman Sr., attends an event honoring Dr. Armand Hammer at the Church Office Building in Salt Lake City, April 18, 1990. Also present is Elder Russell M. Nelson, Mayor Palmer DePaulis and Senator Jake Garn. (Al Hartmann | The Salt Lake Tribune) Cancer patient Debbie Sticinski has an emotional moment after getting a hug from Jon Huntsman Sr. in a chance meeting in the new wing at Huntsman Cancer Institute on Wednesday, October 26, 2011. (Tribune file photo) Karen and Jon Huntsman. (Leah Hogsten | Tribune file photo) Jon Huntsman in 2005. (Tribune file photo) L to R: Clarke Nelson. Jon Huntsman and Patrick Kilbourne, of Salt Lake City at the Graduation of the Wharton School of the Univeristy of Pennsylvania's first West Coast MBA for Executives class in San Francisco. on August 28, 2003. (Tribune file photo) Jon Huntsman. (Steve Griffin | The Salt Lake Tribune) Jon Huntsman, left, hugs cancer survivor and fellow Sigma Chi brother Brandon Plewe, following press conference announcing the fraternity's commitment to raise $10 million for cancer research at Huntsman Cancer Institute (HCI), pledging to be ÒThe Generation to End Cancer.Ó This is believed the largest gift committed to one charity in menÕs fraternity history. To acknowledge the commitment, the sixth floor of Huntsman Cancer Hospital will be named ÒThe Sigma Chi International Fraternity Sixth Floor.Ó The gift is a gesture of Sigma ChiÕs vision of friendship, justice, and learning to ease the suffering of cancer patients and their families at the Huntsman Cancer Hospital in Salt Lake City, Monday, June 15, 2015. (Tribune file photo) Jon Huntsman in 2001. (Tribune file photo) Jon Huntsman and Norm Bangerter are seen in this undated photo. (Al Hartmann | The Salt Lake Tribune ) Jon Huntsman speaks to staff members of The Salt Lake Tribune Monday August 22, 2016 about challenges and upcoming changes for the news organization. (Rick Egan | The Salt Lake Tribune) Jon Huntsman gathers together with some of his family members as they celebrate the new $50 Million building in the Jon M. Huntsman School of Business, Wednesday, March 16, 2016. (Scott Sommerdorf | The Salt Lake Tribune) Jon Huntsman announces a new donation and initiative to expand the Huntsman Cancer Institute on November 1, 2013. (Leah Hogsten | The Salt Lake Tribune) Karen Huntsman hugs her husband, Jon Huntsman during the 2016 Huntsman Award for Excellence in Education ceremony, Friday evening at the Little America Hotel by the philanthropists. She told the crowd of educators that she almost lost him last month due to health complications. (photo courtesy Elder Ronald A. Rasband) Jon Huntsman, Elder Ronald A. Rasband, Norm Bangerter, Jake Garn and Wayne Owens aboard Huntsman's jet. (photo courtesy Elder Ronald A. Rasband) Jon Huntsman Elder Ronald A. Rasband and Leninakan, Armenia. (photo courtesy Elder Ronald A. Rasband) Jon Huntsman and Elder Ronald A. Rasband at a Jazz game. (photo courtesy Elder Ronald A. Rasband) Elder Ronald A. Rasband and Jon Huntsman fishing in Driggs, Idaho. (photo courtesy Elder Ronald A. Rasband) Elder Ronald A. Rasband, Peter Huntsman and Jon Huntsman at the Huntsman Chemical facility. (photo courtesy Elder Ronald A. Rasband) Sister Barbara Ballard, Elder Russell M. Ballard, Sister Inis Hunter, President Howard W. Hunter, Jon and Karen Huntsman and Elder Ronald A. Rasband tour a Huntsman Chemical facility in Bayport, Texas. Christena Huntsman Durham James Huntsman Jennifer and Dave Parkin with their daughter Ruby. Kathleen Huntsman (Scott Sommerdorf | The Salt Lake Tribune) Utah Governor Jon Huntsman Jr. responds to reporter's questions about the state budget being dealt with in the legislature, Thursday, Feb. 26, 2009. (Francisco Kjolseth | The Salt Lake Tribune) The Salt Lake Tribune' new owner, Paul Huntsman visits the offices to wrap up the final details on Tuesday, May 31, 2016. (Scott Sommerdorf | Tribune file photo) David Huntsman speaks about the family history of a commitment to fight cancer is, and how that is the basis for what his father announced to day. Mr. Jon M. Huntsman Sr. announced a new donation and initiative to expand the Huntsman Cancer Institute, at the Grand America Hotel, Friday, November 1, 2013. Huntsman Corporation President and CEO, Peter Huntsman, rings The Closing Bell¨ at the NYSE on Feb. 17, 2011. Mark Huntsman (photo courtesy Huntsman family) Jon Huntsman and his brother Blaine in 1938. (photo courtesy Huntsman family) Jon Huntsman sits at a table covered in documents before closing on a deal to buy a polystyrene plant from Shell Chemical in 1983. (photo courtesy Huntsman family) Jon Huntsman and his family pose with egg cartoons in this 1971 photo. (photo courtesy Huntsman family) Jon Huntsman in 2005. (Leah Hogsten | The Salt Lake Tribune) Jon and Karen Huntsman, along with their son Mark, attend the dedication of the Primary ChildrenÕs and FamiliesÕ Cancer Research Center on June 21, 2017. (Trent Nelson | The Salt Lake Tribune) Jon Huntsman Sr. speaks at a party to celebrate The Salt Lake Tribune's 2017 Pulitzer Prize for Local Reporting. Christena Huntsman Durham, who administers the endowment her father started to help the homeless, remembered him as a competitive man who treated everyone like a friend. The family would go to the park on Saturdays, she recalled, and Huntsman would time the kids at the 50-yard and 100-yard dash. He had an “I beat dad” award that he would give out if one of them could best him at a sport, a right of passage. James Huntsman works on the distribution side of the movie business, after spending two decades at Huntsman Corp. He said his father always taught him to be bold and recounted his dad once painting “E-L-V-I-S” on the side of their neighbor’s vintage Volkswagen beetle as a prank. Paul Huntsman, owner and publisher of The Salt Lake Tribune, called his father “one of the most remarkable men that has walked this earth” and one who sought to follow Christ’s example. Jennifer Huntsman Parkin, who oversees the Huntsman Education Awards, stood with her brother Mark, who suffered brain damage at birth, and cherished his unconditional love. Each child spoke, except for David Huntsman, who was not in attendance because he is serving as a LDS mission president in D.C., a post his father once held. Jon Huntsman Jr., the oldest son, embraced his father’s passion for politics. Beyond his ambassadorships, Huntsman Jr. is a former Utah governor and a 2012 Republican presidential candidate. To the right of the dais, standing out from the dozens of flower arrangements, were two that featured the numbers “56” and “26.” There was also a large family photo and a folded U.S. flag, recognizing Huntsman’s service as a gunnery officer in the Navy. At the graveside service, the younger generations released white balloons. Among those in attendance at the funeral were Utah Gov. Gary Herbert, former Republican presidential nominee Mitt Romney, state legislative leaders, the University of Utah basketball team and many from the world of business, including Gail Miller, owner of the Utah Jazz. Sitting near the front, too, was Huntsman Cancer Institute CEO Mary Beckerle, whom the Huntsmans fiercely and loyally defended during a 2017 spat with the U. After the service, the family held an open house at the institute’s new Primary Children’s and Families’ Cancer Research Center, fulfilling one of Huntsman’s wishes to have a lighthearted community barbecue after he died. The event was loud and buoyant, with people swapping stories while eating brisket and chicken and sneaking handfuls of jelly beans, gummy bears, M&Ms and orange peanuts. Several men walked about wearing navy blue hats with the words “Great Great Guys” and the initials “JMH” embroidered in white. Christopher Huffman, son of Huntsman’s late daughter Kathleen, explained that Huntsman had founded a sort of club among his grandsons and male in-laws. They held an annual meeting to discuss family issues and to remind one another to live according to a code of conduct, such as opening doors for women, sticking up for one another, being kind to strangers and giving to those less fortunate. Huntsman was Utah’s wealthiest resident for many years and one of the world’s most generous philanthropists. He gave at least $1.8 billion to charity in his lifetime. Peter Huntsman joked that his father gave away money faster than his company was earning it. But his biggest flaw, his son said with a smile, was that he couldn’t sing. Tribune reporter Eric Walden contributed to this story. Editor’s note • The Tribune’s owner and publisher is Paul Huntsman, a son of Jon Huntsman Sr.